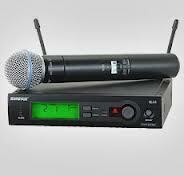 Wireless Microphone Hire Sydney, Cheapest Wireless Microphone hire in Sydney! Our Wireless Radio Microphones will cover a large area as long as this has line of site from the receiver to the transmitter (Microphone) it will cover between 60 and 100 meters depending on conditions, often greater distance can be achieved with external Antenna, or by locating the receiver unit high above the ground. great for presentations, Corporate Events, Artist Requests, weddings or anywhere you need a wireless microphone. you can have up to 50 units operating at the one time if required. Our hire price is only $30 Each Unit - That's Sydney's Cheapest price. $30 is for complete set microphone and receiver.